When clients say they’ll forget where their files are if they file them away, I tell them that it’s not their filing they fear; it’s their filing system. Let me prove this point to you. Do you leave all your pots and pans spread out all over your kitchen floor? Do you leave all your clean underwear, socks and T-shirts mixed in heaps all over your bedroom floor? Do you leave all your bath towels and wash cloths piled in your hallway near the bathroom? Well, why not? How can you possibly find your pans, underwear, socks or T-shirts if you don’t have them out where you can see them? The answer is that we have found a useful system — a good home — for these various items so essential to our daily lives. So why do so many leave their files out in front of them in mounds, piles and stacks on their desks, credenza’s and tables? Again, it’s not the filing they fear, it’s their filing system. The foundation of a successful filing system is categorization. In my workshops and seminars, I suggest that you categorize your files by your work processes. I give examples such as articles, budget, clients, contracts, financials, projects, reports, research, training, and vendors. The cornerstone of categorization is consistency. This consistency must span three areas: 1) paper files in file cabinets or file drawers, 2) document folders on your computer, and 3) email folders. Once you have installed a consistent and categorized filing system for paper, computer and email files, putting things where they belong will be a breeze. Never again will you need all your files piled all over your floor, or your computer desktop covered with a hundred unrelated files, or an inbox a thousand emails deep. 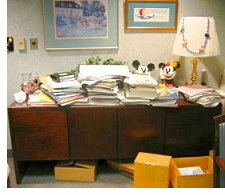 That’s what a successful filing system does for you! Check back next week when I follow up on the subject of file naming — the secret of consistent categorization!